The Irish Minister for Agriculture, Food and the Marine, Simon Coveney has warmly welcomed the historic Paris climate change agreement that has been reached by 195 countries from across the planet. Speaking at a Farm Europe conference in Brussels on the 14th December Minister Coveney said: “ It is appropriate that we are having a discussion today on sustainability, two days after the historic agreement in Paris which seeks to limit global tempeature increases to less than 2 degrees, and to pursue efforts to achieve 1.5 degrees through binding commitments to cut greenhouse gas emissions”. The Minister also noted that the COP agreement includes a clear recognition of role of forests in mitigating climate change and the need to account for both emissions and removals “ this is something that the Irish Government has been emphasising at EU and UN levels for some years ” . 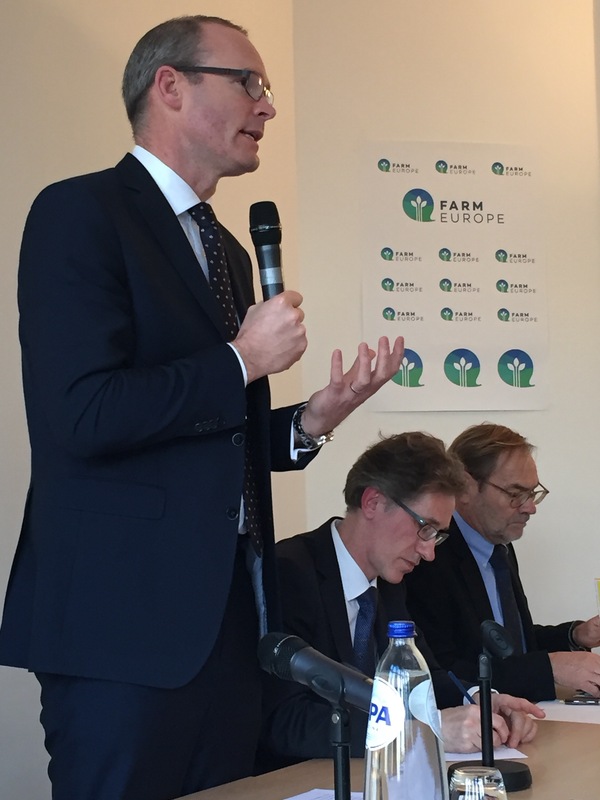 Speaking to an audience of EU officials and stakeholder representatives at the Farm Europe event, Minister Coveney however emphasised that these commitments at COP and in the European Council do not mean that there will be a “free pass ” for agriculture in the global effort to fight climate change. He said that agriculture and forestry could and should play a key role in climate change mitigation and adaptation. “ In Ireland our ambition is to be a global leader in sustainable food production. We already have a climate efficient agriculture, but we want to do mu ch more and to ensure that we are and remain the most sustainable producer or milk, beef and other products in the world .” The Minister said this commitment was manifest in the strong emphasis of our Rural Development programme, worth almost €4 billion over seven years, on environmental benefits, bringing the latest innovative sustainability research and practices direct to farmers. The Minister also underlined that Food Wise 2025, our new strategy for the development of the agri – food sector, has sustainable production at its core and sets out a number of specific recommendations aimed at managing growth in a sustainable way and in measuring and monitoring the sustainability credentials of the sector. Such a level should be achieved within a time-frame sufficient to allow ecosystems to adapt naturally to climate change, to ensure that food production is not threatened and to enable economic development to proceed in a sustainable manner.